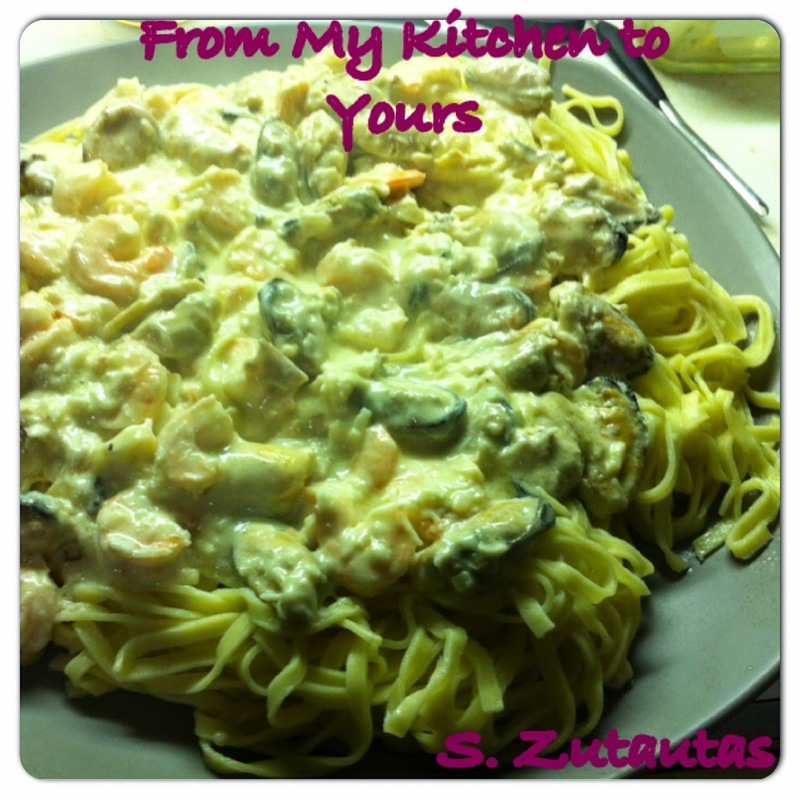 Recently I was in PEI, Canada, and had the most amazing seafood linguine. After the first bite I knew I had to go home and try to replicate the dish. Mine is slightly different than what I had in PEI as that linguine had scallops, lobster, and shrimp. The best thing about this pasta dish is that you can add what you have on hand as far as the seafood goes. 1 cup of cooked crabmeat (I precooked crab in it's shells, and then cracked and removed the meat) The next time I make this dish I will use canned crab meat. Prepare the crab if you're using fresh or frozen shelled, and cook and peel your shrimp. In a large frying pan over medium heat melt your butter and saute the garlic. Whisk in cream and cook until thickened. This should take about 6 min. Add the cheese, salt and pepper. 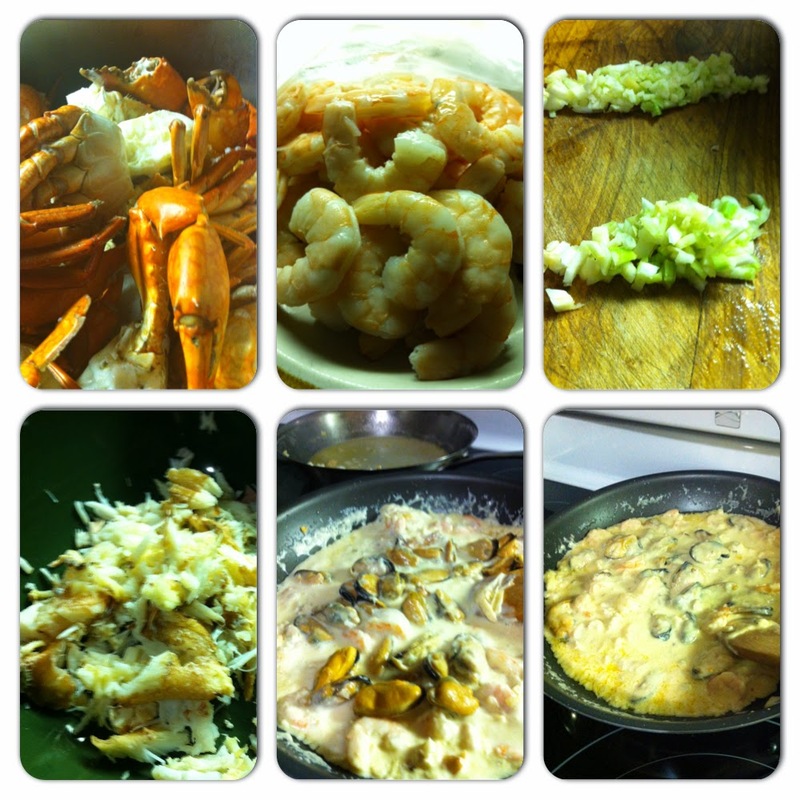 Next add the crab meat and shrimp. In a pasta pot or large pot cook the linguine according to pkg. directions. Once it is cooked, drain, add a bit of olive oil to toss and set aside. While the water is boiling and the linguine is cooking, heat a medium size frying pan and add 1/4 cup of butter to it. To the frying pan add the garlic and saute for about 3 min. Next add the muscles and wine cooking on medium heat for approximately 5 min. or until muscles are cooked to your liking. Add the muscles along with the wine and butter sauce. Stir. On a large serving platter lay out the linguine. Add the contents of the large frying pan to the top.